Jockey Boris Thornton (left) rides Hit Snooze to win the Two Year Old Handicap at Eagle Farm. One of the best decisions trainer Steve O’Dea has made in recent times was not to send his two year old Hit Snooze to north Queensland. Hit Snooze ($18) made it two wins in a row when she beat Magic Beans ($9.50) by long head with a short neck to Pull Anchor ($4.40) third in the TAB Two Year Old (1400m). 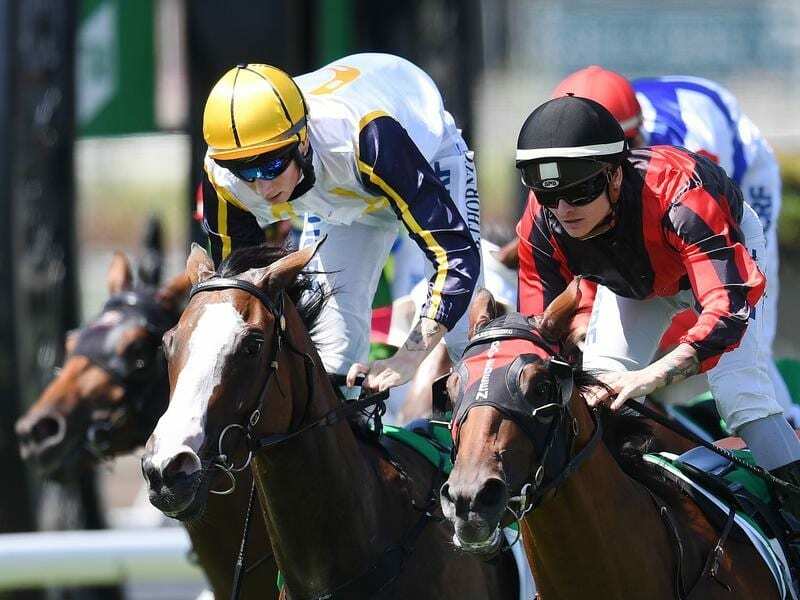 The chances of Hit Snooze winning the race at Eagle Farm hinged on her pre-race mood and on Saturday it was much better than her four previous starts. A cheap buy at $8000, the filly by sire Wicked Style has shown plenty of ability but also a nervous demeanour. At her first start she was a handy third at the Sunshine Coast before spelling and returning to trial impressively. But at her first start back from a break she went into meltdown in the parade ring and eventually was well beaten in a Doomben midweek two year old. Trainer Steve O’Dea worked hard on getting the filly to relax on race day and added pre-race earmuffs to her gear. Hit Snooze showed what she could do by leading all of the way to win a Doomben midweek two year old 10 days ago. “She has always impressed me but to be honest I was very tempted to send her to Townsville after her first-up failure this time,” he said.